Legend has it that some pretty crazy things happen in the Natural State of Arkansas. Spoken word and oral history have created quite an interesting unofficial culture here. From Bigfoot to Inner Earth, you’re sure to enjoy this list of 10 myths and urban legends in Arkansas. While most science-believing citizens agree that the Earth’s outer core alone disproves this myth, there remains a population of folks who see beyond the iron-solidifying pressure known to exist at the Earth’s inner core. According to his diary, a man named George D. Wright discovered an underground civilization, thus proving the Shaver Mystery of Inner Earth. Wright supposedly discovered a network of subterranean tunnels that lead to a highly civilized race of people living inside of a Hollow Earth. Legend has it that Blowing Cave is one of only five entrances to this mysterious world. The Legend of the Arkansas Traveler is said to have been started by Colonel Sanford C. “Sandy” Faulkner, a foundational part of Arkansas’ early statehood due to his military campaign through the area. As the story goes, Faulkner lost his way as he traveled north through the Arkansas wilderness. It is said that Faulkner asked for directions at a humble log cabin where he was greeted by a fiddle-playing squatter. After a round or two of questions followed by elusive but humorous answers, Faulkner offered to play the second turn of the squatter’s tune. Delighted that Faulkner could play the second half of his song, the squatter opened his home to the traveling man, as is customary with the southern manners of Arkansans. What turns this tale into a legend is that the song sung by the fiddles that day has no agreed upon composer. “The Arkansas Traveler and Rackinsac Waltz” was first published in 1847 in Cincinnati. On Arkansas Highway 300, just north of Little Rock in Pulaski County, you’ll find a rare geological formation called Natural Steps. The area was given this name due to its two parallel, vertical walls of sandstone which stand 20 feet apart. The area forms a step-like appearance, and rise 51 feet above the bank. Stories abound when it comes to the Natural Steps. The Benedict Transcript, an antiquarian relic, was discovered here and an 1876 Masonic Marker commemorates one of the most spectacular gatherings that occurred there. Legend has it that Jesse James and his gang spent the night in Natural Steps, robbing a Benton stagecoach the next day as they traveled to Hot Springs. Another legend states that the Confederates once sunk one of their gunboats in order to keep Union soldiers from getting the gold on board. Yet another legend surrounding Natural Steps features a young bride named Martha Sanders whose new husband, Gustavus, died shortly after their dream wedding. The grief-stricken Sanders, also known as the Woman in White, disappeared just a few days later. This myth lives on as Sanders can supposedly be seen each year in late October wondering about in the Natural Steps Cemetery. Legend has it that some 350 years ago, Spanish conquistadors traveled north through the wilderness in search of a city of gold, also known as The Seven Cities of Cibola. To keep Native Americans from taking their enormous treasure of gold, it is said that the conquistadors hid their treasure in a cave that has kept it secret ever since. 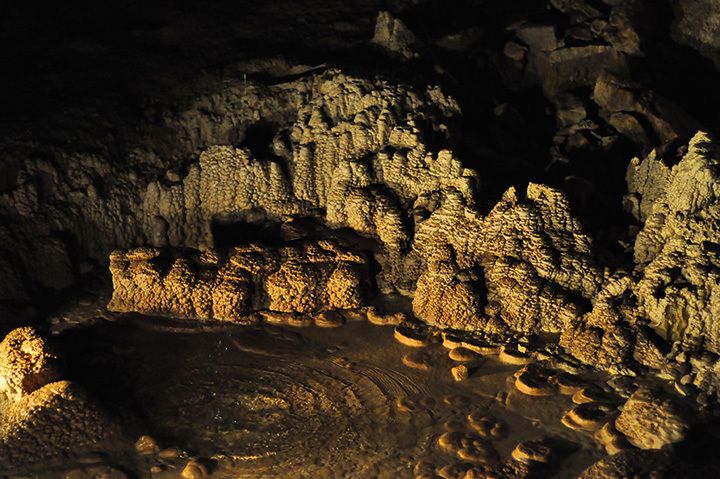 The Old Spanish Treasure Cave is located on Highway 59 between Gravette and Sulpher Springs. Visitors are welcome to pay for a guided tour and learn why it is believed that the cavern still hides the gold today. The Legend of Petit Jean began in the 1700s when the king granted permission for a Frenchman named Chavet to explore part of the Louisiana territory as well as giving him a grant to claim part of the land. Chavet was engaged to a beautiful girl from Paris named Adrienne Dumont who was desperate to stay close to her fiancé. When she wasn’t allowed to accompany him on his adventure to the New World, Dumont disguised herself as a boy named Jean. Somehow she was so convincing that not even Chavet recognized her as the cabin boy on his ship. Sailors gave her the name “Petit Jean,” which means “Little John” in French. After spending the summer atop the mountain, Petit Jean became ill and it was during this illness that her deception and identity were discovered. Sadly, young Dumont died shortly after and was buried in the land where she had spent her last days. Today her legend lives on as some say that a low earth mound discovered years later, now called the Petit Jean Grave, provides a certain enchantment to the mountain and overlook that keeps drawing visitors back. Legend has it that somewhere in Boone County is a small, unmapped town called “Self.” Somewhere in Self is a place called Devil’s Hole Cave, a mysterious and unexplored cavern. Although the year is unknown, it is said that one day the land owner decided to explore this area. After descending some 200 feet into the cave, the man was greeted by frightening hissing coming from the darkness surrounding him. Sometime later the man and others from town lowered a flatiron tied to a rope down into the darkness. They heard the heart-stopping hissing again as the rope was given a hard tug. After pulling the rope back up, they discovered the flatiron badly bent. They repeated this experiment, tying a stone to the end of the rope this time. Again they heard the same hissing and the rope was pulled hard. When they pulled the rope up again the stone was gone. The creature has never been identified. The Ozark Howler, also known as the Ozark Black Howler or the Devil Cat, is an urban legend not only local to Arkansas, but to Texas, Missouri, and Oklahoma as well. With a cry that has been likened to something between a wolf’s howl and an elk’s bugle, this creepy cat-like monster is said to still be roaming the Ozark Mountain region. In fact, the last sighting of this bear-sized beast was reported in last year near Lake Springdale on Pump Station Road. Locals claim this creepy, dark-haired cat has glowing eyes and horns. This myth, called the Witches Hollow, is brought to you by Cave City near Cushman, Arkansas. As the story goes, a witch once practiced her black magic in the abandoned houses in this village. It is said that at some point the witch also murdered her husband here. Her deceased spirit is said to still haunt the land today and sightings of her disturbing ghost have been reported off Sandtown Road as she walks along the dirt road. Rumor has it though, that visitors will never find the Witches Hollow without the guidance of a local named George. As this legend goes, it all started in 1819 on Halloween night when an English naturalist, Thomas Nuttall, and his crew settled in on Moss Mountain, making camp on Beaver Island. In the wee hours of Halloween, the group was viciously attacked by what most believe to be wild animals. It has been reported that Nuttall, one of the only five men to escape the massacre, saw his men being attacked by several human forms. Each year on the anniversary of this unexplained encounter, people tour Moss Mountain where the murderous beings supposedly still creep up from the river to terrorize visitors.